The Amaryllis Apron by Dimensions is just what you need for your holiday baking and cooking. Beautiful blooms are featured on this stamped cross stitch design, perfect for getting in the mood for holiday entertaining. One size fits all. This stamped cross stitch kit contains: Cotton apron printed with wash-away ink, Easy to follow instructions, Thread list on back of package.. 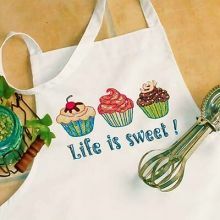 Preparing home-cooked meals is definitely "the sweet life" for those who love to cook. This Tuscan Flavor Apron by Dimensions in stamped cross stitch makes it even more enjoyable when you show off both your culinary and needlecrafting skills! One size fits all. This stamped cross stitch kit contains: 100% cotton apron printed with wash-away ink, Easy instructions, Thread shopping listNeedle and t..